Let me Tell you a little about the South West Wedding Award’s and how they work . So the Award’s cover the whole of the South West - Bristol, Cornwall, Devon, Dorset, Gloucestershire, Somerset and Wiltshire . There are categories for everything wedding related from Photographer’s to florist’s to cake maker’s to Entertainment to Venue’s and so forth. “ The Awards recognise those businesses which exceed the expectations for their customers, providing outstanding service and inspire their customers to want to actively and positively promote them”. Once I entered , couple’s whose weddings I have covered during the given timescale can vote for me on the below criteria scoring 1- 10 . They can then also leave comment’s. 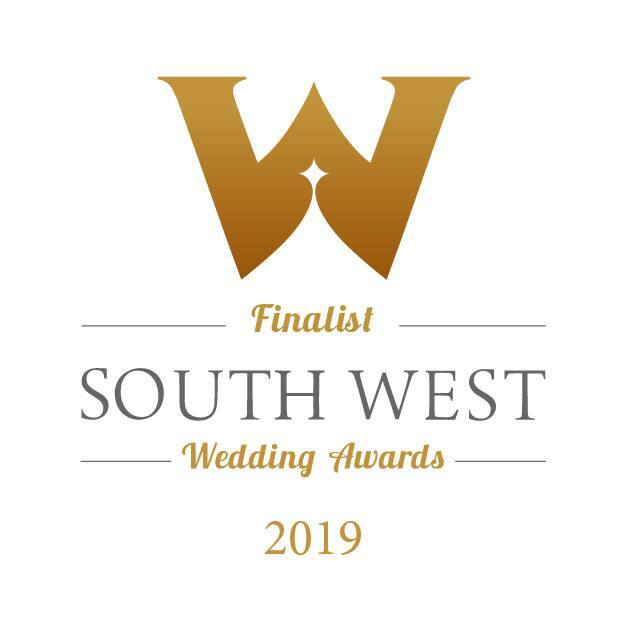 The South West wedding awards admin team then determine the highest scoring businesses from each category who then get announced as finalist’s. It is then at that point the finalist’s submit a mission statement , which is compared against their client comments and our website and social media is judged. Each year as the award’s get more known , there are more and more entries. I last entered the award’s in 2014 under the category of Classic Photographer , back then there was 4 in my category- sadly i didnt win BUT after only having my business set up for two years to make it to the finals I felt I had won anyway ! I did not think for one minute that this year I would get to the finals as the scale of entries was massive . According to the organiser’s of the awards they had the most amount of entries ever. Well………. thanks to my amazing client’s I got announced as a finalist , this time under bespoke photographer alongside 13 other amazing photographers. I was amazed and so very very grateful. Again sadly when the award’s came I missed out on the winning spot BUT I am elated at even being a finalist in such a massive industry. I have just received all the client comment’ s that were submitted to the panel and I have welled up with happy tear’s at reading them. You can find them below , so grab a cuppa and have a read ! . I am BLOWN away at people’s words and kidness and can’t thank all those that voted enough for taking a snippet of time out of their day to support me and my business……. little ole me …. crazy ! Honestly ….. THANK YOU , THANK YOU, THANK YOU , it means the absolute world to me. Certain events or moment’s always stand out at any wedding I photograph and when I think back to Daniel and Victoria’s wedding back in january there a few things that stand out but it’s actually a concept that stand’s out for me the most and that was Victoria’s wedding dress! It was truly stunning and did actually make me gasp the words “wow” when I entered the room. What made it stand out I hear you ask…..well, it was two dresses in one!!! If that is not genius styling I do not know what is. She had a slimline fitting Amanda Garrett ‘snowflake’ dress full of sparkle and hand beading which was so fitting to a winter wedding. Victoria then co- ordinated it with a voluminous tulle over-skirt and baby blue pure silk sash and voila she had achieved two looks for one day, removing the tulle skirt for the evening reception. I adored her idea and she pulled it off beautifully. What she also pulled off was that Daniel actually had no idea she was going to transform for the evening - he had no idea that it was in fact two dresses as the blue sash made it seamlessly look like one. So when she came down stairs after the wedding breakfast and he was at the bottom waiting for her his face was a picture. Talking of styling the venue decor was by Wedding’s By Claire. All of the details so carefully matched other elements of the day such as bridesmaid dresses, flowers and so forth. Let’s talk doughnuts …… opting not to have a traditional wedding cake ( anyone who know’s me I am a huge lover of little breaks in tradition), Daniel and Victoria provided an impressive display of Krispy Kreme doughnuts which were served as dessert’s. The smell……oh my days, the smell! ( Did I mention the smell) The aroma of these said doughnuts filled the room and it was divine and as boards of these doughnuts were passed around the guests they became a real talking point! It was safe to say they went down a storm. Something else that went down a storm was that Daniel and Victoria booked a Caricature artist to draw guests whilst enjoying reception drinks! It is so fascinating to watch an artist work and see these drawings come to life , such talent and also very enjoyable to watch the recipient recieve their sketch! When Victoria walked down the aisle, she walked down to the incredible voice of local singer Tamsin Ball, she also sang during the signing of the register and through the reception! Wow, what a beautiful voice, I could have listened to her all day, and after having a little chat with her when she finished she is also the most lovely person too. Also something that was very fitting to a winter wedding was sparklers! which we got some shots of just before the evening guests arrived and the first dance as husband and wife took place. During the first dance some of the guests joined them on the dancefloor and as the song changed and picked up pace ready to party I thought the choice of Van Halen’s ‘Jump’ was perfect to get the party started .